The kitchen is the most integral part of any home. It is the place where the most blissful memories are created right from burning your first dish to cooking up a storm with your mom or your significant other. Ironically, the room which plays such a pivotal role in every household is neglected the most. 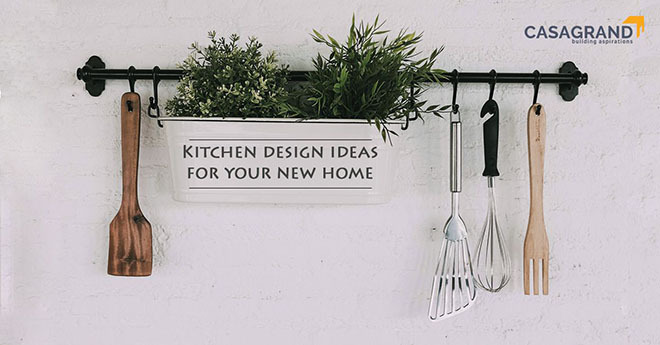 Here are a few ideas to spruce up your kitchen area and make it catalogue-ready in no time. It is always a good option to keep a theme in mind while designing your interiors. Embrace the digital life by opting for an ultra-modern kitchen with handy gadgets in an understated design. Modern kitchens scream out elegance as they are packed with helpful electronic gadgets and appliances which make cooking a dream! You can add a pop of colour by painting an entire wall in a bright hue or stick strips of vibrant wallpaper over the kitchen counter. It is also advisable to make good use of the natural lighting that enters your kitchen. Opt for curtains in pastel shades for a sophisticated look. To make your kitchen appear bigger, try letting your drapes flow all the way from the ceiling to the floor. This will make your kitchen look more stylish and graceful. Your interiors have a lot to say about your personality. Celebrate your uniqueness by opting for a contemporary kitchen design to show off your love for quirk. Complement the layout of your kitchen with a radiant black-and-white tiled floor. This checkerboard design will brighten up your space and make your kitchen a fun place to unwind in. Hang up an oversized piece of art or a vibrant abstract image to dramatise the area. You can also convert one of the kitchen cabinets into a funky bookshelf with a collection of all your cookbooks and family recipes. Try placing a few high stools near the kitchen counter for unconventional stove-side dining with a statement chandelier of recycled mason jars acting as the perfect conversation starter. Old-school kitchen designs never go out of style. Their rustic charm and cosy ambiance make them a classic which every family loves to indulge in. Go traditional with your kitchen interiors by putting up wooden shelves accompanied with a granite table top to show your love for conventional designs. Make the place more homely and welcoming with snug vinyl flooring and indoor plants. Take your design game up a notch by hanging up vintage utensils and crockery on rustic hooks placed conveniently along your table top. The minimalist design is apt for small kitchens spaces that accommodate nuclear families. The key factor of minimalism lies in the smart use of space. Try making your kitchen area as efficient as possible by using up the spaces above the cabinets as storage. You can also build a hidden cabinet under a stairway or loft for extra storage. Double up your kitchen counter as a cosy dining area for two. Hide your kitchen appliances behind cabinet doors with built-in plug points. You can also keep your microwave and refrigerator in modular shelves, hidden behind the cabinet doors, for an ultra-minimalistic look. Love the sea but do not live in a coastal area? Bring your affection for the ocean into your kitchen by choosing a nautical theme for your cooking space. Keep your design muted with an aquatic blue and white concept on walls and shelves. Paint the inside of your cupboards in blue and keep the rest of your kitchen white for a dramatic effect. Bring in the seaside charm by hanging up quirky starfish hooks and mermaid themed crockery. You can also drape your windows with flowy white curtains to welcome your visitors with a mirage of crisp sea breeze. Moving into a new house is an overwhelming experience. The perfect kitchen will not only make cooking a relaxing chore but will also inspire you to design the rest of your house passionately. Make sure you read our blog on Gruhapravesam tips for your new home and our home safety and security guide to make the shift into your new home as hassle-free as possible. Visit Casagrand and find your haven in the top places in Chennai to buy your dream home.